The Rebel Sweetheart. 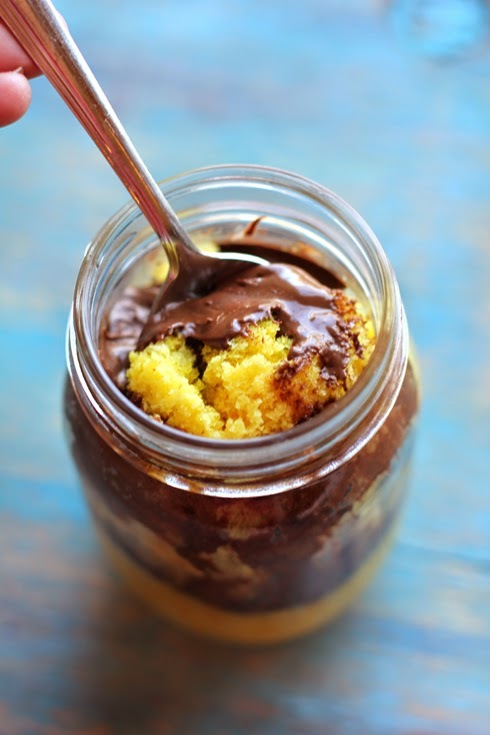 : Foodie Goodie | Nutella Cake in a Jar. Oh, the many things you can do with Nutella! You can spread it on wheat bread, make brownies with it, use it as frosting, use it as a doughnut filling... heck, you can even lick it straight from the spoon! The possibilities are endless! 1. Thoroughly wash and dry the inside of each canning jar. Spray the inside of each jar thoroughly with nonstick cooking spray. Set aside. 2. Stir the Vanilla Butter and Nut Flavoring into the cake mix. Spoon about 1 cup of cake batter into each jar. 3. Cook one jar at a time in the microwave for 1-2 minutes, or until the cake is cooked through. 4. Allow jars to cool slightly, then scoop the top half of cake from the jar. 5. Spoon a tablespoon or so of Nutella into the center of the jar, replace the top half of the cake back in the jar then top the warm cake with another layer of Nutella. 6. Serve immediately or cover with a lid and store in the fridge. Cakes should stay fresh in the fridge for up to 5 days. I haven't tried baking using a microwave. Ma-try nga to... pero naman, papak lang ng Nutella solve na :p.
I am a huge sucker for anything with Nutella. It's my favorite thing in the world. I love Nutella! That's one of the things I miss eating while on this diet. Yum! I've seen a few cake in a jar recipes, and Nutella is great on everything, this looks great! Oh, nice! My friend mentioned about mug cakes but I am too lazy to research, so thank you for this post. The ingredients can be bought in the grocery! Awesome! I've never tried Nutella, but this looks yummy. I will have to give it a try! Yummy, this looks so good. I'm guilty of eating a spoonful of Nutella. Easy and i think I can follow this! Must note to hoard Nutella next time I visit the grocery. You pretty much just changed my life with this single post. Oh my word! This is an awesome idea indeed. I love the jar cakes and it is so easy to make for sure. Thanks for sharing. You had me at Nutella. You would not believe how fast my family goes through a jar. I have to hide it from them. This cake in a mason jar looks delicious! What a great way to use the cake mix. My daughter would flip cartwheels for your recipe here.